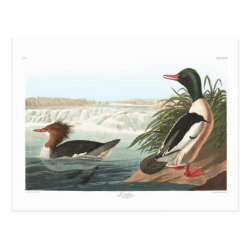 A pair of Common Mergansers is featured in this vintage painting art by famous bird artist John James Audubon. The image is captioned "Goosander" which More... today is the common name for this species in the United Kingdom and Europe. A male bird stands on the shore while a female showing a ragged crest swims in the water. The original lifelike work was completed around 1836 to be part of Audubon's masterwork Birds of America.